Voice of the Collector: Jakks Pacific Delivers a KO to McFarlane . . .
. . . by landing the exclusive action figure license for the UFC. Released in October, the figures garnered little attention in the traditional collectible figures crowd. However, that appears to be changing as the success of the Topps trading card brand, the growing popularity of MMA, and the realistic detail have combined to turn these "toys" into a collectors item. While the MMA is still very much a niche market it is quickly gaining traffic and market share on both professional boxing and the WWE with fans and collectors alike. Taking a page out of the McFarlane playbook, Jakks Pacific has incorporated chase figures into the products formula and prices on the secondary market ala eFee (eBay), reflect the popularity of this still relatively "new" sport. The figures feature a patented technology called Ultra Flex™ , allowing for extreme degrees of articulation. 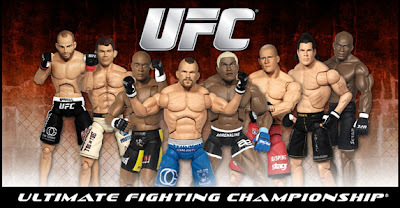 Series 1 features such favorites as Chuck Liddel, Anderson Silva, and Michael Bisping to name a few. Current retail price is $12.99 IF, and I mean a big IF, you can find them in stock. Many a Wal-Mart and Toy 'R Us employee reports being approached as they are about to stock the shelves and customers purchasing entire unopened cases. Of course no novice to toy production, Jakks Pacific produces an accessory line for the UFC, complete with Championship Belts and of course The Octagon. You can find out more about them at Jakks Pacific.